Smile in a Day™ – 100 year old patient! 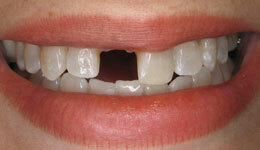 "Plain and simple, you can never be too old for dental implants. This procedure was simple for me." -G.G. MINIMALLY INVASIVE SOLUTIONSThis 100 year old patient had a severely decayed front tooth. This tooth needed a crown lengthening procedure to restore the crown. However, this procedure would have been more invasive than the treatment she received. Instead, the was extracted and replaced immediately with an implant. A temporary crown was also placed at the same visit. No incision or stitches were needed. Her natural smile was preserved on the same day of treatment. "I was mortified when my crown broke. What was I going to do without this front tooth? I looked like a jackolantern. But my problem was solved that day with an implant and crown." - M.P. Save your smile - in one day!This patient came in with a fractured front tooth which resulted from an old root canal, post, and crown. The tooth was removed, and an implant with an esthetic Zirconia abutment and a crown was placed in the same visit, meaning the patient never had to walk around with a missing tooth in public. "I was scared that if I took my tooth out my smile would change like my mother’s did. Then my dentist educated me on the benefits of preserving my jaw bone. It worked out nicely and now my implant looks like a natural tooth." - B.A. Get your smile backThis patient had a fractured tooth due to internal resorption. We extracted the tooth, and performed a bone graft with gelfoam to preserve and grow enough bone at the site of the extraction, so that an implant could be placed. Patient wore a "flipper" in the interim while the graft healed. Because of the socket preservation and the bone grafting, the profile and width of the implant site were maintained, and we were able to place an implant in a minimally invasive manner - without an incision. An esthetic Zirconia abutment was placed, and then a temporary crown. The patient left the office the same day with a smile! "In my profession my smile is everything…..I was so happy that I never had any pain or swelling for each step of my treatment…. 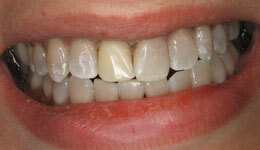 The result was so natural that my wife couldn’t even tell which tooth was the implant!" - -M.N. You'd never guess it was an implant!This patient presented with a severely infected front tooth, and an uneven gum line. The tooth, (see black arrow), had a recurrent root canal infection as a result of multiple failed attempts at apicoectomies/root canal surgeries. The hopeless tooth was extracted atraumatically. Bone mineral and barrier membrane were placed in the socket at the time of extraction in order to preserve the shape of the gums. 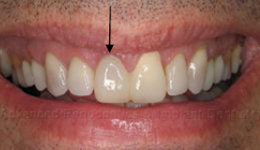 A temporary crown was placed while the area healed. After complete healing, the implant was placed with an incisionless/minimilly invasive technique. After the implant integrated to the bone, a final crown was placed. 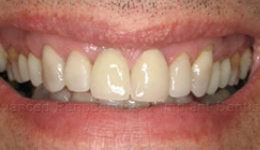 Not only was the patient’s smile preserved, there was also no shrinkage of tissue around the new tooth. 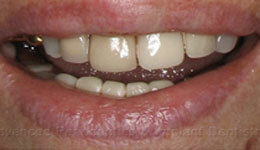 The adjacent tooth gum was lowered to match the implant resulting in a symmetrical smile! Advanced Periodontics & Implant Dentistry is home to several highly accomplished oral surgeons. Schedule a personal consultation to learn whether you might be a dental implants New York candidate. In addition, Advanced Periodontics & Implant Dentistry’s dentists can help you if you are looking for a highly skilled periodontist in New York / New Jersey.